1. You get extensions for all your property listings. You can record audio tours in your own voice or use our text-to-speech voices which will automatically speak your typed message. 2. We capture each and every Caller ID and transmit the leads to you instantly by Text Message. 3. Callers can choose to connect to speak with you immediately or leave you a message. You can listen to your messages by simply opening your email. 4. You can automatically send immediate Text Messages to your callers with instant-click links to your website & photos. Your callers can view your data pages at the same time they are speaking with you. This is the best combination of Text, Data, and Voice service! I thought 'Sell Smarter, not Harder' was just a slick slogan. But when my office phones started ringing, I realized that HotlineAmerica is the real deal! I love the surprise I hear in the prospect's voice when I call him within a few minutes of his calling our 800 number. Hotline America gives us instant capture of the name and telephone number of each caller. It works! My Yard Signs carry my exclusive 800 number. Every call is captured in our "follow up" log at no extra cost. The entire service is covered by our low, monthly fee to HotlineAmerica. A great investment! You can't beat a Yard Sign that talks! Imagine a couple standing before a house they like. They call the toll free, 800 number on the sign and get an audio house tour that I wrote myself! Best of all, all the phone calls are free. People like it! If there is one thing home buyers want, it's information. HotlineAmerica puts info right at my yard sign! No waiting! No delay! Give people what they want and they will buy! I give my prospects an instantly available recorded tour of each house they are looking at! I write the information and record it so the prospect hears it in my own voice. All included in my low, monthly fee. I don't know who reads my newspaper ads. But, I do know who calls and listens to the house tour on my toll free 800 number yard sign! I get their name and telephone number immediately, so I can follow up within minutes! It's foolproof! These days, the mortgage business is rough! I need referrals and I get them by providing my Realtor friends with HotlineAmerica's service via yard signs on their listings. They repay the favor with names and telephone numbers of mortgage prospects. I used to have to wait until the agreement of sale to get the names of new home buyers, but now, I get them as soon as they call one of my Realtor's 800 number on his yard sign. I provide the sign, thanks to Hotline America, for a small monthly fee that I can easily afford. My advertising budget consists mainly of yard signs that I provide to Realtor friends in return for mortgage leads. It's a win-win situation. The realtors sell homes and I get solid-gold leads! It has built my business! 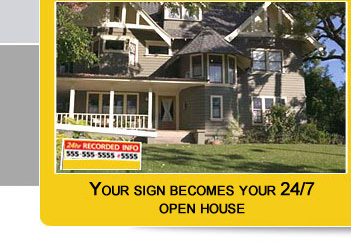 Via HotlineAmerica, I provide talking yard signs to the Realtors with whom I deal. When prospects are standing before a house they like, they can call the toll-free 800 number to get a recorded house tour. When that happens, the Realtor immediately gets the buyer's name and telephone number which becomes a rock solid mortgage lead for me! When I decided to sell my home myself, I needed help! On the Internet, I found Hotline America. Through them, I was able to place a talking yard sign in front of my home. 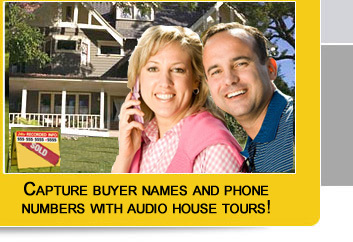 It features a toll-free 800 number that people can use to get a full audio tour of the house. I sold my house in less than six weeks! I knew I needed a "For Sale" sign for the front of my home, but I did not know where to go. A friend told me about HotlineAmerica on the Internet. They fixed me up with a talking yard sign that lets prospects listen to a recorded house tour, specifically about my home. I got three prospect names and telephone numbers the first week! There is no better sales aid in the Real Estate industry than Hotline America. They make it possible for anyone - Realtor, Homeowner or Mortgage Specialist to earn the names and phone numbers of real prospects. With the blessing of experience, you can't go wrong! I have watched Real Estate trends for three decades. I am impressed with the services of HotlineAmerica. 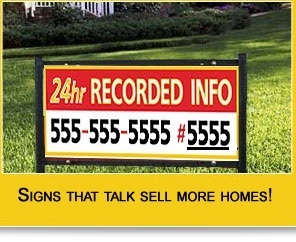 They provide talking, point-of-sale signs that allow prospects to call a toll-free 800 number to listen to a recorded house tour. Each prospect name and telephone is then instantly available to the sponsor for follow-up.